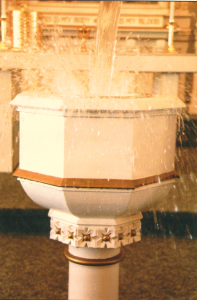 As Water is poured into the baptismal font at the beginning of each worship service, we are reminded that we are called to “walk wet” daily in the covenant of our baptism. We bring living water of our Baptism into a parched and dry world. This is God’s work within us, so that His presence might “splash out” into the places where He calls us daily, to work and serve in His name.